When it comes to animal rights and the vegan ethic, Colombia is a country of conflict. In 2013, it became one of the first worldwide to ban circuses with wild/exotic or native animals, yet does virtually nothing to protect its abundant native wildlife. Interest in vegan eating is on the rise, yet concern for farmed animals is nearly nonexistent. Nearly non-existent, that is, in the sense that there is one woman working almost singlehandedly to turn that situation around. 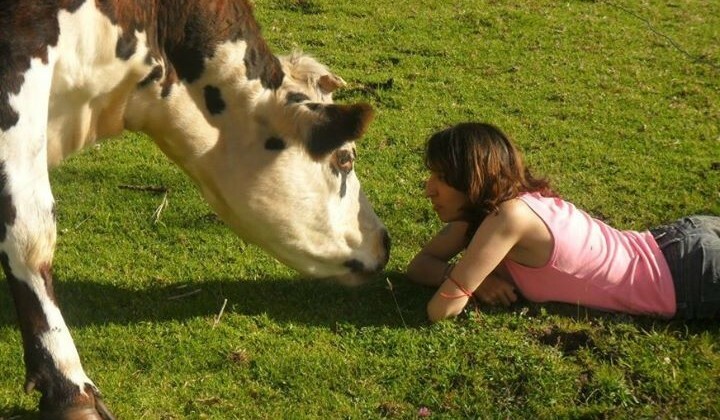 Juliana Castañeda founded the Paramatma Animal Sanctuary in Colombia’s Andes Mountains in 2009, and it remains the only vegan animal sanctuary in the country as well as the only shelter in South America to rescue cows. Aside from farmed animals, the organization takes in animals from laboratories and unwanted companion animals. The sanctuary strives to place animals in loving homes, but cares for 34 permanent residents who are victims of abuse and trauma, too old, or too ill to be considered adoptable. At the same time, Paramatma – Sanskrit for “god in the heart” – also advocates for animal rights and veganism in its country and worldwide. We spoke to Juliana about the issues affecting animals in Colombia, and her work at the sanctuary. What do you see as the biggest problems animals face in your country, or the most pressing issues animal advocates are dealing with? Animal circuses have been banned, so that’s encouraging, and more advanced than we are in the U.S., but clearly there is work yet to do. There are certainly good people working hard to get better animal protection laws enacted, but Colombia still has many problems with animal rights because the issue is simply not so important to the vast majority of the country. Right now we are lucky that in the capital city, Bogota, our mayor likes animals and is doing his best under the circumstances to enact new animal protection laws. But everything is about money: if we want a law, we have to pay a lot of money just for a referendum. For example, although we don’t have horses working in the streets anymore, bullfighting is legal again. The fact remains the success of these initiatives is dependent upon money, and the focused dedication of the public. Colombians however are not known for their generosity, eagerness to focus, or strictness in following rules. For example, we can’t throw garbage in the street because there is a law that requires us to pay a fine, but sadly Bogota is one of the dirtiest cities in South America, and no one pays a fine! So we can have laws, but getting citizens to follow them is another thing altogether. It is a serious flaw in the public mindset. What are some of the obstacles to greater interest in animal protection? Are they economic, cultural, lack of awareness, a combination of factors? A combination of these factors. We are not a rich country, so we need money to create a law and then promote it to the public, but again, Colombians are not good at following rules. There are some animal protection laws in place already, but the authorities don’t bother to make sure people follow them. It is certainly not lack of awareness; the people here know very well the basic laws of animal protection, but they also know that they can do as they please, and in most cases they will not be held accountable. Colombia has incredible biodiversity, and is one of the planet’s ecological hotspots, but wildlife poaching and related crimes are the rule rather than the exception. It seems this is an area where there should be greater concern from the international community, or am I being paternalistic? Colombia really is amazing. You can see many virgin areas still. Colombia has the international community’s interest because the country has claim to a very large part of the Amazon forests. But this interest does not translate too well to positive action, as there is no real effort to preserve these resources, and more and more companies are starting to exploit our natural resources. Colombia is like ‘gold’ for international eyes – we are a source of fresh new money, and so the interest is really what they can take from this country and not what they can give. It seems that there is a growing number of vegan restaurants and health food stores in the big cities. From time to time vegan tourists report they had no trouble feeding themselves. Is this based in health concerns, or are you hopeful this can translate to increased compassion for animals? Yes, you can find all the fruits and vegetables you want here, and at a bargain price compared to the U.S. We have many more vegetarian/vegan restaurants than when I first became a vegetarian some 20 years ago. The vegan and vegetarian movement is growing fast, but still it is relatively small and powerless here, and according to my friends in the U.S., we are at least 15 years behind countries like yours or Australia. I always ask my boyfriend to bring some vegan products from the U.S. each time he visits. I don’t know if a more developed vegan product market will increase the compassion for animals, but surely with more vegan options, there would be less animals suffering. In any case, I feel that compassion for animals is much more than adopting a vegan diet. And sadly, I have come across many harsh, inconsiderate and rude vegans. It appears that many vegans think that not eating animals is enough, but I feel we need to do much more than that. We have to fight for animal justice, like warriors, if we want to see a peaceful and happy world. How did your sanctuary get its start? For farmed animal sanctuaries in the U.S., the typical story is there was one particular individual who needed a home. Well, this animal sanctuary was my dream since childhood. Maybe this has happened to you, maybe not, but when I was six or seven years old I told my mother, “Mom, when I grow up I want to buy a big house and I am going to help all the animals.” I kept this ideal and worked hard, resigning my life, my personal pleasures, normal relationships, and every penny I could make to fulfill this dream. With this strong desire in my heart and my love for animals, I am totally aware that I can never go back to a normal life, and that my only reward will be the happy wagging tails of my animals. I invested my life savings in this “big house,” and I started to help animals as they came to me. Some were rescued, while others were brought to me. I’ve been helping animals since I was seven years old. My parents were very kind to allow me to keep animals in my room that I found in the street needing care. I would take them in, feed them, heal them, and then help them find a new place. I was very lucky that my best friend Ekala was ready to support me in this ideal, also resigning his personal life. He doesn’t have any friends aside from the animals he cares for. He is cleans the farm, feeds the animals, and works hard with no personal pleasure. So a little girl had a dream and with determination, she made her dream real. I can say with a big smile on my face: I’m living my dream. Tell us some of the stories of animals you’ve rescued who now have a home at Paramatma. 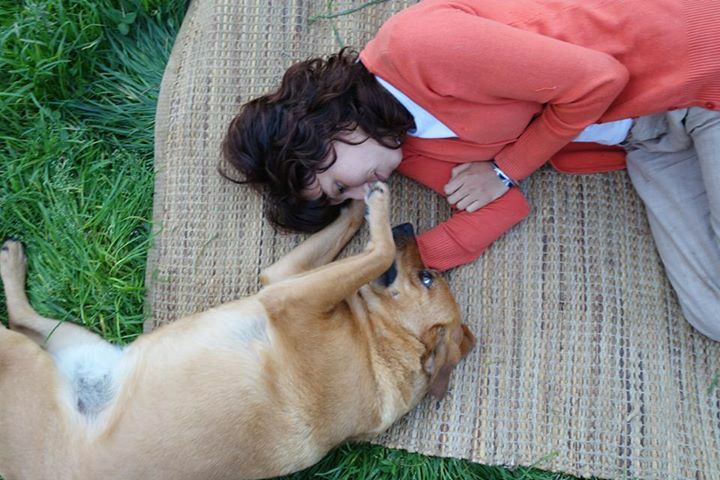 Oh, I have too many stories, but my dog called “Milk” has claim as the real Paramatma Animal Sanctuary founder. It was one Sunday, three days after my birthday, that I heard a puppy crying, so I was like, “where is this coming from?” I crossed the street and I saw an abandoned cardboard box. I opened the box and found this little puppy angel, maybe three days old, her body still covered with placenta, weeping. I took her in my hands and she immediately started sucking my little finger. At that moment she accepted me as her mother, and we were born the same day, February 14th, Valentines’ Day, a day celebrated for love. We are soulmates! Right now she is eight years old and is still my little angel. Another story is of a dog named “Ahimsa.” I was walking down the street and saw a dog sitting in a corner. This dog was very similar to my Milk, so I came near to say “hi,” but the dog was afraid and timid. When I took a closer look I noticed a gaping wound in her throat – it was totally open! I could see her bones and the inside of her throat. Her former “owner” had placed a collar around her neck when she was a puppy, and this same small collar remained there, even though she was now a young adult. The smell of her open wound was terrible, but when I tried to take her she ran away. After two hours of chasing her, she gave up, exhausted and I was able to take her to the vet and pay $200 for her surgery. Her wound healed in time, but one day her body became infested with worms, and one more time we had to save her life. Today, Ahimsa is a very happy and healthy dog. Another time, I rescued 13 dogs from a neglectful woman that had them all living in a small bathroom. This so-called “animal lover” promised to provide all the food for her dogs if we gave them a home, but she never did and all of sudden I had 13 more mouths to feed! Fortunately, I found a nice home for 7 of the dogs, but the others are still with me. 80 percent of the animals in my shelter were abandoned by people who told me they loved animals, or were rescued from the street and placed at my farm without consideration as to how I was going to feed them. Sometimes I too feel abused by these humans. We also have a cow who was rescued from the slaughterhouse and a bull from a dairy farm whose mother jumped the fence of the farm next door to come onto our property to give birth. Suddenly we had a little baby calf. The dairy farmer tried to take the calf, but we protested and paid him $100. Sadly, he took the mother, so the newborn calf, who we now call “Balaram,” never got to drink his mother’s milk, but he is also now safe at our sanctuary. You take care of dozens of animals with minimal resources and help, and even have another career so you can put everything you personally earn into supporting the animals. You manage on very few donations and one volunteer. How can people help you from North America? Yes, we have no volunteers other than Ekala, and receive very little donations from my country, maybe $20 per year, no more than $25 a year. We receive only one or two visits a year to the farm. Moreover, just a handful of people actually like what I am doing at the shelter. Most people think I’m stupid and wasting my time helping a variety of animals, including cows, when there are so many abandoned dogs in the street. But I see all animals equally – cows, chickens, pigs, rats, cats, rabbits and dogs. Up till now, my salary is all that has supported this project. Every penny I earn goes to the animals, and other animal protectors whom I help with donations. Unfortunately, I lost my job a few months back, and if not for the generous support of two U.S.-based non-profits, Food for Life Global and A Well Fed World, as well as the donations of many kind Americans, my animals would be starving. It’s not easy to find a well-paying job in South America. A fair salary is almost a dream. The basic salary here is only $340 a month, and many people earn less than $2 an hour. So it is understandable that they cannot help a project like mine. Most people are just trying to survive. I turned to crowdfunding to help me raise enough money to survive at least one year. With the success of this campaign, my plan is to use the time to work exclusively on developing a business to support this project and make it self-sustaining. My country is struggling economically and Colombians generally don’t like to donate to charity – it’s just not part of the culture – so I am begging all animal lovers to please support me in this noble effort to provide health and security to these innocent animals. Thank you so much for taking time away from feeding everyone to speak to us. Is there anything else you’d like to add? Thank you very much. I’m very touched knowing that other people care for these animals. I have a nice property, and just need a little help. Every dollar goes a long way in this country. More importantly, I want to educate people. I may not be able to save all the animals in my country, but I can teach people to stop hurting and abusing animals and to start seeing them as equals. All living beings deserve love and respect, just as Saint Francis of Assisi taught. My big dream is a world where there is true spiritual equality of all beings. It is a dream that is bigger than my animal sanctuary. If a tiny woman like me, in a country so politically and economically depressed as Colombia, can somehow keep a sanctuary working for seven years on her own, can you imagine what I could do if more people helped me? Something amazing, for sure.